Holly Holm has been placed in co-headlining status tomorrow night at UFC 184, due to the fact she is widely considered to be one of the sport’s most promising bantamweights. 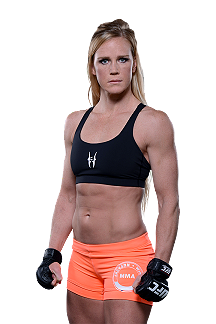 Not only has Holm gone 7-0 to date in MMA action, but the 33 year-old holds a resume that is packed with boxing championships. On Saturday, Holm will make her UFC debut against Raquel Pennington (5-4), who is coming off a choke-out victory over Ashlee Evans-Smith in December. UFC 184 will be hosted by the Staples Center in Los Angeles, California.